Having discovered that I could have driven another mile towards my objective – I had parked in the edge of the forest but it’s a nice walk so not to worry – I followed the left hand track to the old dam wall of the old or lower Neuadd Reservoir with beautiful views to the highest peaks of South Wales around the head of the valley, and crossed it to gain the open mountainside throgh a gate. The profusion of rhododendron bushes along here at nearly 1500ft indicated that I was further south than my usual destinations of Snowdonia or the Lake District and indeed this was my first time in the Beacons. 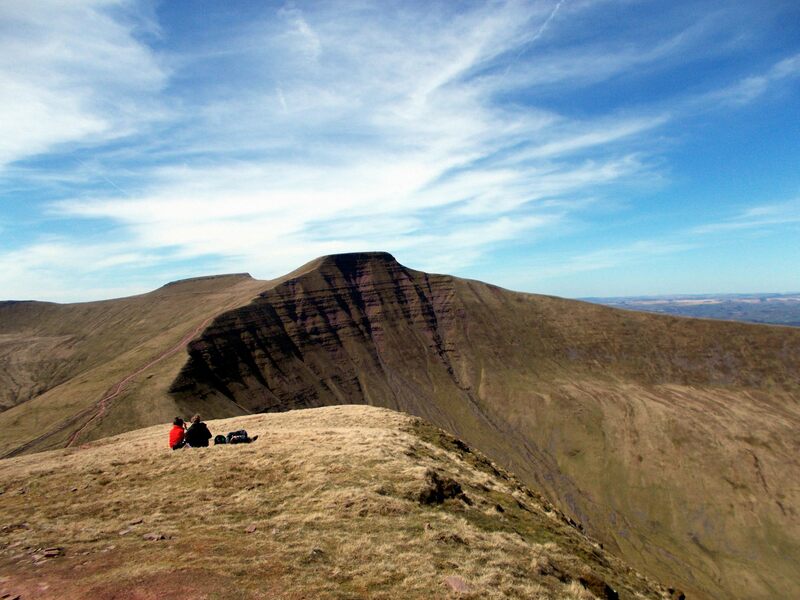 A wide trail led up the steep grassy slopes towards the crest of the ridge which revealed itself as the edge of a wide plateau, along which an easy trail led roughly northwards towards the summits. 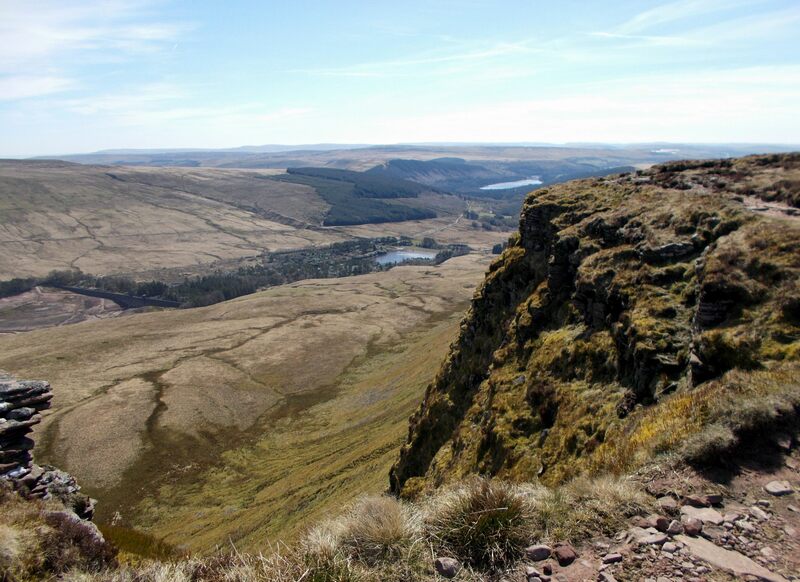 The first top was reached with surprising ease as the views southward towards Cardiff and the hazy distance of the Bristol Channel expanded to include the wild looking hills of Camarthen Fan to the West. 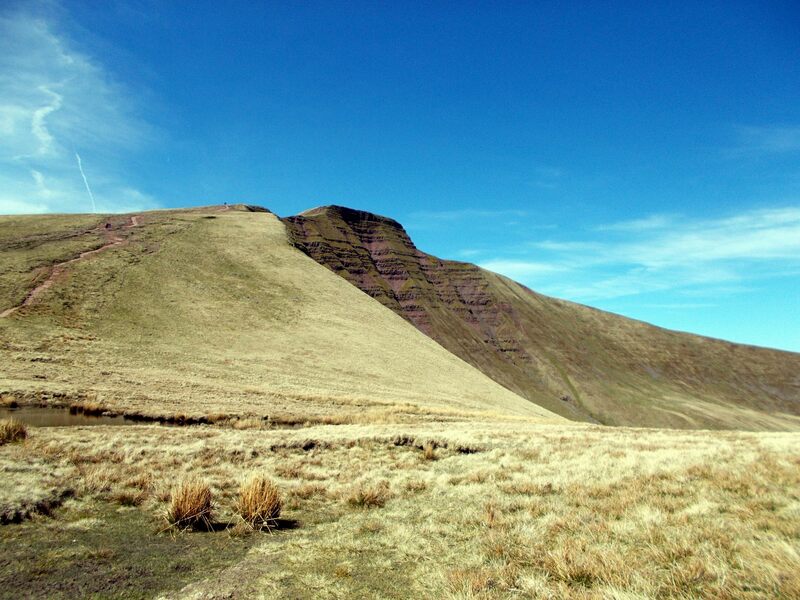 From here a small dip followed by a short steep climb led to Corn Du; the first of the main summits of the Brecon Beacons. 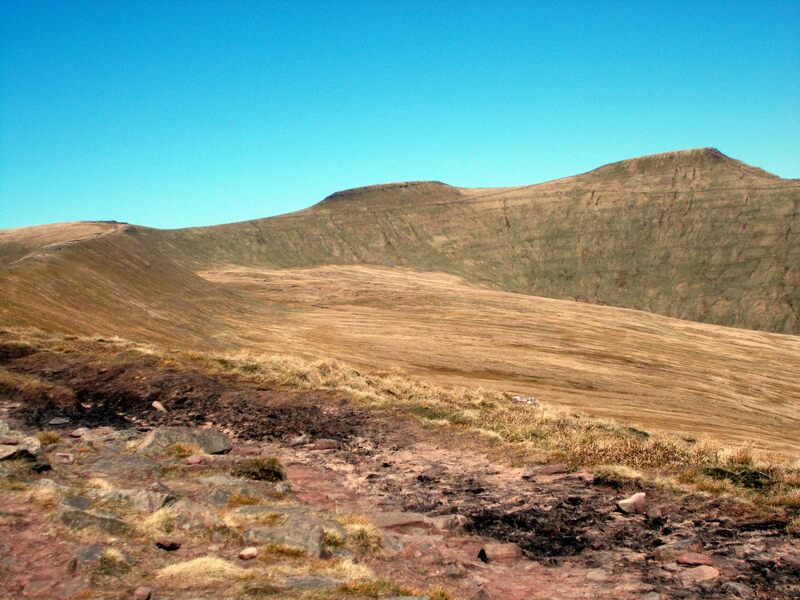 straight to the next peak Pen y Fan. 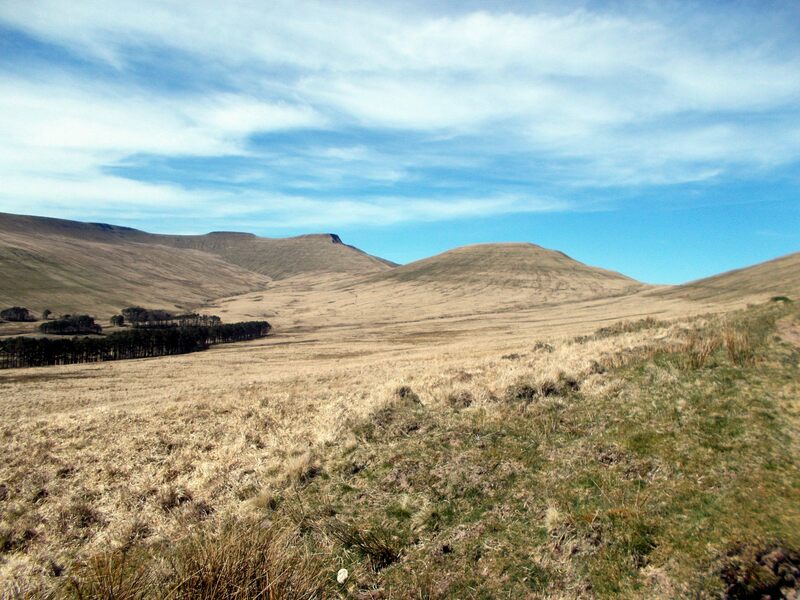 That indeed was my next objective and a brief battle with the wind brought me the short distance to where they congregated around the large cairn marking bthe highest point in South Wales and southern Britain. The views from here extend from the Bristol Channel and the Devon coast to the South while the northern vista leads far into Mid Wales though today the distance was somewhat hazy. Camarthen Fan which is really the western part of the Brecon Beacons lay to the West while the other way the line of the Black Mountains rose along the horizon beyond large areas of lowlands.It’s different to Snowdonia where you are usually surrounded by mountains as other than the immediate peaks of the Beacons the other ranges are a long way off and it gives a huge sense of space. 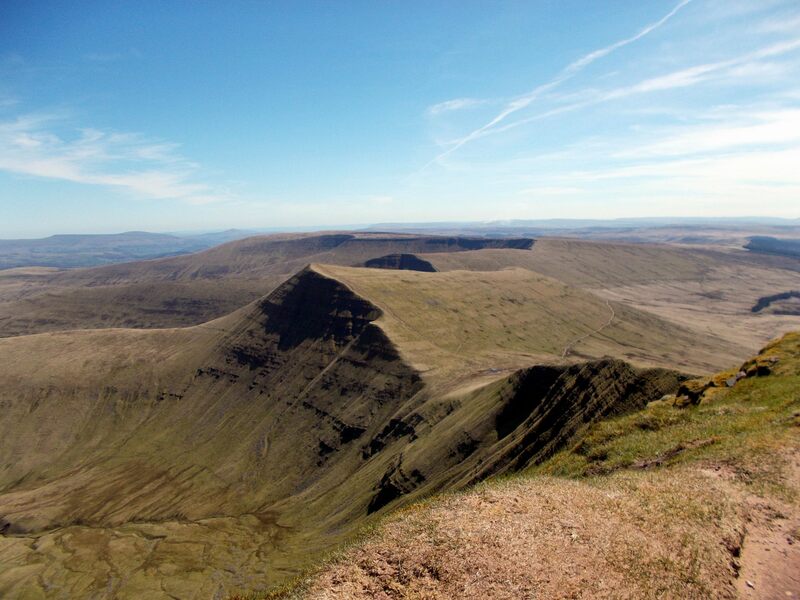 One of those nearer peaks though is Cribyn just along the ridge and this was my next objective. a 400 foot climb after an easy couple of miles. The path right from this col misses out Cribyn if you really can’t face it but it would be a shame to miss as it’s the finest of the 3 peaks despite being slightly lower. 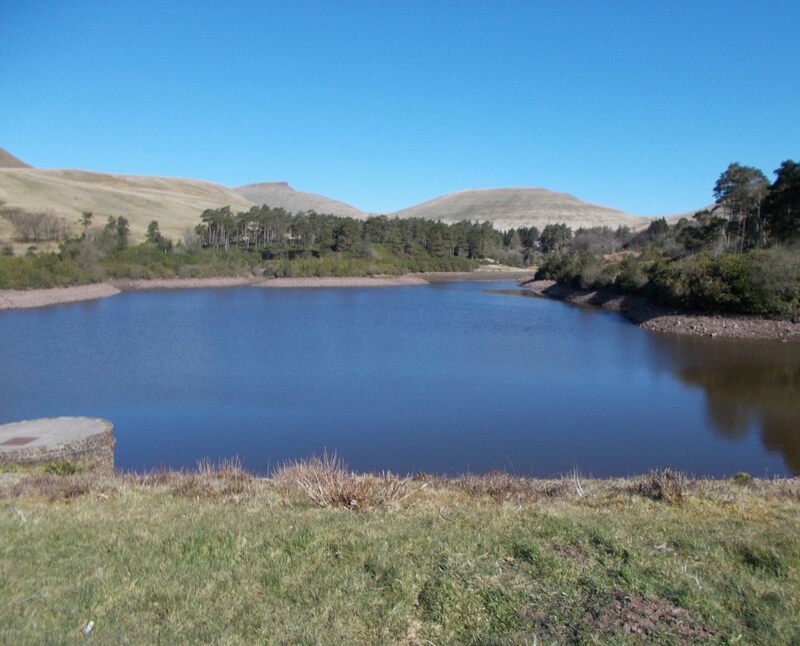 Here as on the ridge below, far from the day trippers, you can experience the peace of the hills once more. small group of wild ponies along the way. The distance was only noticable once I reached the top car park and had to go the extra mile to Taf Fechan Forest but on a day like this I was not complaining. Glad you liked it Morgan – always good to be distracted from manic Mondays! 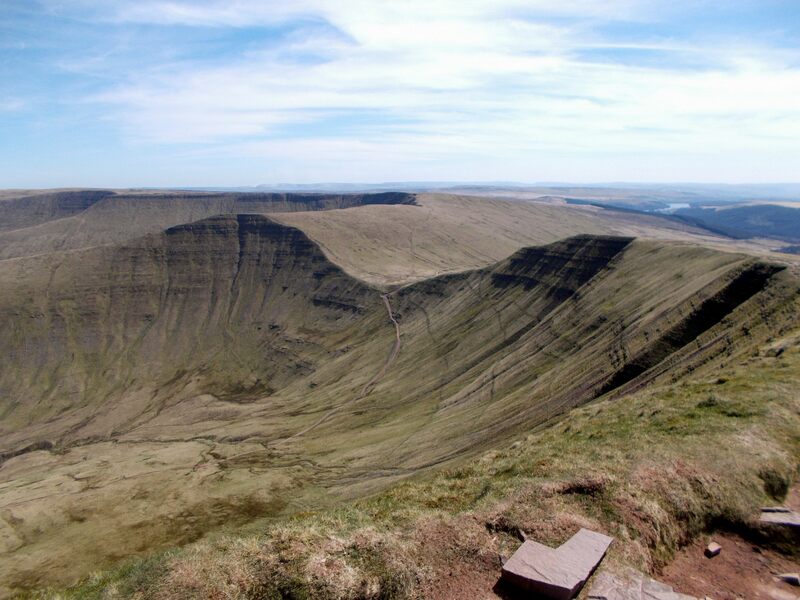 I have never visited the Brecon Beacons although I have seen many images of that area. You had a perfect day for this trip Pete and captured some great images. 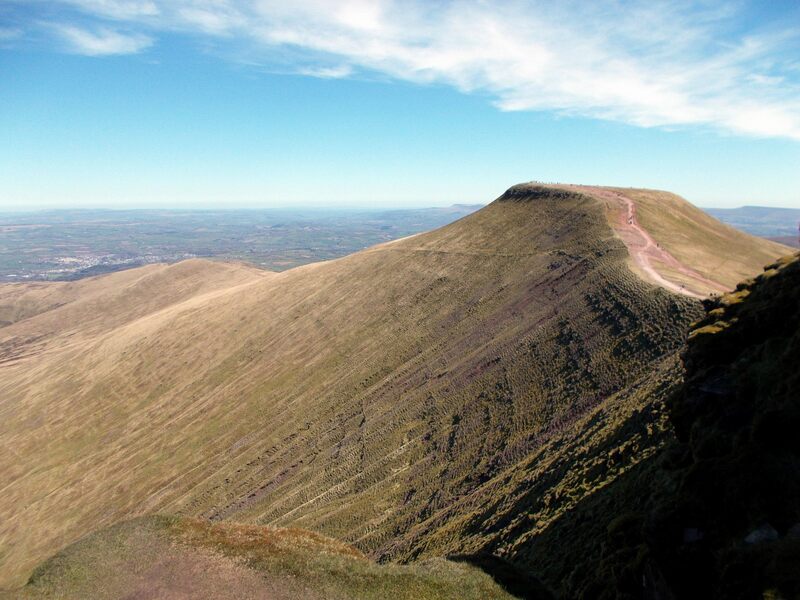 Thanks Andy – it was my first time there as I normally go to Snowdonia. I was pretty lucky with the weather though! Wow!! gorgeous photos! what a killer day..blue skies just incredible! I was luckly to go in what was pretty much the first warm weather of the Spring!